Antilles ou Indes Occidentales par Th. Doutovenay. 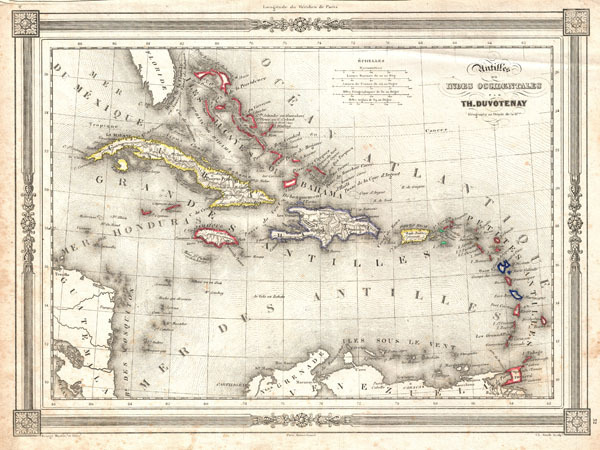 An attractive 1852 map of the West Indies by Th. Duvotenay. Covers from Florida to Venezuela and from Honduras to Barbados. Includes the Bahamas, Cuba, Jamaica, Santo Domingo (Hispaniola), Porto Rico, and the Lesser Antilles or Windward Isles. Throughout, Duvotenay identifies various cities, towns, rivers and assortment of additional topographical details. Features a neoclassical decorative border. Prepared by Th. Duvotenay for publication as plate no. 32 in Maison Basset's 1852 edition of the Atlas Illustre. Duvotenay, T., Atlas Illustre (Maison Basset), 1852. Good. Some foxing mostly confined to margins. Blank on verso.